The 2017 Concours of Elegance will host the first public display of the ex-HRH Prince of Wales Aston Martin Virage Volante 6.3, as part of Abbeyfield Sports & Classics Ltd’s Specialists’ Showcase display. 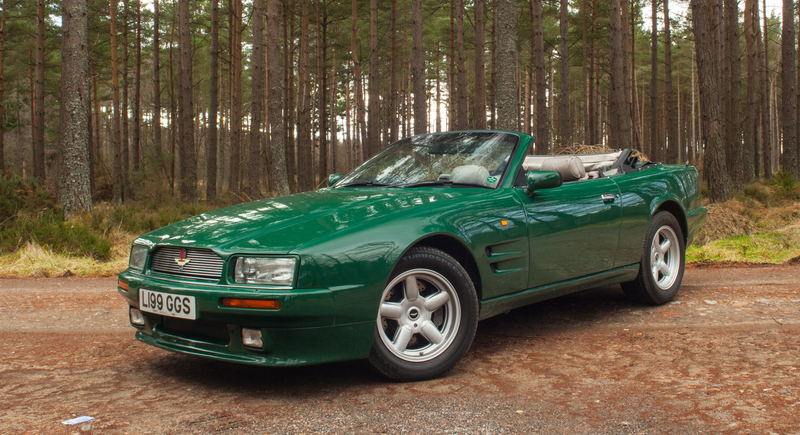 Firmly cementing a long-standing love affair between the Windsor household and Aston Martin, a replacement car for HRH The Prince of Wales’s V8 Vantage Volante PoW came along in 1994 in the shape of this stunning Virage Volante. Following a similar theme to its predecessor, the Prince requested that the Virage Volante retain the standard, and more discreet, narrow body whilst housing the much more powerful 6.3-litre version of the venerable Aston Martin V8, producing 456bhp. Mated to a much sportier five-speed manual transmission, rather than the more ubiquitous four-speed auto of the time, the car is a true “wolf in sheep’s clothing”. To assist with the power increase, the chassis modification also included sports suspension, 18” alloy wheels with Goodyear 285/45ZR18 tyres and vented and cross-drilled disc brakes at the front. The front air dam came from the “wide-bodied” car which had bigger vents to aid with cooling. This car is believed to be only one of three ever built in this configuration, and certainly the only one ever to come with Royal provenance. Finished in his favoured colour scheme of British Racing Green coachwork, a green Everflex roof and Mushroom & charcoal hides in the interior, chassis number 60107 is also fitted with enhanced communication equipment specified by his security detail. It even retains its matching leather covered sugar cube jar for his polo ponies discreetly mounted in the centre console. His Royal Highness used the car from new until 2007 whereupon it returned to Aston Martin to be displayed within the Gaydon Production Facility until its sale in 2012 to a private collector.